You know how Google does special illustrations on its homepage for holidays and notable birthdays? We collaborated with them on today’s page. 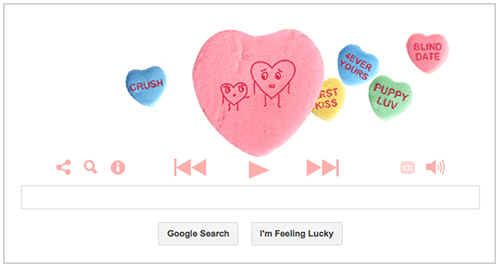 It features love stories, produced by our show, with animations created by Google artists. There’s a whole team of people who make these homepage graphics at Google, which are called Google Doodles. I think my favorite moment working with them came during an early conference call. We were talking about how we needed music to put under the voices. Should we commission original pieces for this or just license music that’s out there already? Of course, to license music, you need to estimate how many people will hear it. The more people, the more you pay. “How many people will come to the Google homepage that day?” I asked. They were joking about how many zeroes are in that figure but you get the point. Licensing wasn’t an option. Later I was talking with the composer we found, Roger Neill, about the assignment. Roger does scores for movies and TV shows including one of my favorite film scores, for the movie Beginners. Sometimes we use this insanely great piano piece from that soundtrack on our radio show. Anyway, Roger and I were talking about how we’d better do a good job on this, because more people would see these little love stories than anything we’d ever do in our regular work lives. Bigger than being on the radio. Bigger than movies and TV. I’ve been a fan of Google Doodles for a while (though I only recently learned they had a name and that name is Google Doodles). I liked that they seemed able to do anything on their homepage — a crossword puzzle, a Dr. Who video game, a tribute to Saul Bass, a Les Paul guitar or a fully functioning Moog Synthesizer (with its own four-track tape recorder). It’s interesting that in this big global company, with millions or maybe it’s billions of dollars in computer servers everywhere, and all this tech and engineering, they have people doing something for their biggest product – their search engine – that’s so... handmade. And idiosyncratic. This Doodle is their first foray into documentary storytelling and I hope they do more stuff like it. I hope they reach out to Wes Anderson and Laurie Anderson and Anderson Cooper and artists whose names are not Anderson as future collaborators. We made seven mini-love stories for the Google team but because there are only six letters in Google, one had to be cut. It’s pretty great though, a little fable about love, and it’s here. Three of the love stories have appeared on our radio show, in much longer forms. Puppy Love was part of a much bigger story about middle school dances, in an episode about Middle School; Crush is the opening of our episode of the same name; and Kiss is from Four Corners, which aired 15 years ago. That’s comedian Mike Birbiglia doing the interview in Blind Date, part of a story he’s putting together for an upcoming episode. The last two interviews were done by Miki Meek, one of our producers here at the radio show, who was my partner in making the audio for these love stories. Miki and I didn’t see any of the animations till this week and we both think the animators did a spectacular job. Before they began, the only general guideline we all thought would be smart was that the artists shouldn’t just illustrate what the people were saying. The images wouldn’t add enough to the experience if they were literally just showing what the interviewers were describing. (This is something cartoonist Chris Ware was concerned with when he made animated cartoons of This American Life stories for us, years ago.) I love what the Doodle staff came up with. The non-literalness is what makes them great. Some of the animations are like comic riffs on what’s being said. The people appear as dogs or hearts. And when the stories get sad, they nail that too. The Google Doodle team talked about about their experiences working with us here. One weird thing about creating audio for the Internet is that making it sound good coming out of a laptop’s or desktop’s speakers is an art in and of itself – and very different than mixing for car radio or podcast. Honestly we had no idea how to do it, so I was grateful for Jeff Seelye from Dig It Audio to take that over. This Valentine’s Day project happened because I was in San Francisco in November, and got a tour of Google’s headquarters, and met with the Doodle team. They reminded me of the radio show’s staff, the general vibe of the group, and the sense that they’re out to amuse themselves and make whatever will be fun or moving. I think our staff size is about the same too, roughly a dozen people. It’s a weird and idealistic corner in a weird and idealistic company. There was a general sort of “hey wouldn’t it be fun to try to collaborate on something together?” They pitched July 4th as a good possibility. We counter-pitched Valentine’s Day, because the stories could be more emotional. That kind of freaked them out, to have to turn so many little animations around so quickly. They weren’t sure it could be done. Now three months later, here we are. Incredible. Valentine’s Day is a day for love and these stories are a labor of love. PS: We built another special page that collects more loves stories.